Description: Baltic State Bank is a business categorized under banks, which is part of the larger category national commercial banks. 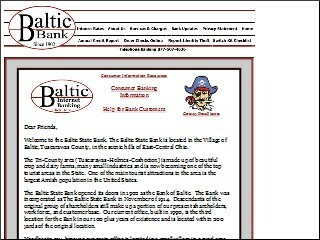 Baltic State Bank is located at the address 101 East Main Street, Sugarcreek, OH 44681 in Baltic, Ohio 43804-0000. The President is John R Rice who can be contacted at (330)897-6401. Location & access map for "Baltic State Bank"